Safety and redundancy go hand in hand. That’s why many pilots (most IFR pilots) have always liked the concept of having a portable GPS and a portable comm onboard. Twenty years ago, portable GPSs had only basic mapping and limited features. But, they could still tell you where you were and how to get home in the event of a problem with primary nav equipment. Naturally, GPS technology steadily improved with moving maps that could display amazing detail and other features that pilots really use. Soon, EFBs (Electronic Flight Bags) took the concept to the next level with “legal” approach plates and features intended for the serious IFR pilot. Still, EFBs were expensive, the hardware was clunky, and there were readability issues, so they really didn’t catch on. However, software designers recognized the chance to use the Apple iPad in the same role and the “digital cockpit” was born. When I first saw a number of software companies introducing aviation apps for the Apple iPad, I remember thinking: “The avionics manufacturers are NOT going to like this!” Let’s face it; Garmin wants to sell you a portable GPS and an MFD. As an avionics consultant, I also remember thinking that this technology was just for “computer geeks” and that the average pilot would not embrace it. I was wrong! That was back around 2007. Today, not only do pilots want it, but the major avionics manufacturers are embracing the concept and offering their own versions (e.g. Garmin with their Connext Wireless Cockpit and Aspen with their Connected Panel). Even Avidyne announced that their new IFD series was designed with WiFi and Bluetooth capability in mind—all to be activated by a later software version. Pilots are getting connected and enjoying not only the financial benefits of using a tablet PC in the cockpit vs. certified avionics, but they’re also discovering that the features available in the apps often exceed those of panel-mounted boxes. Now let’s take a look at what it takes to get connected and what being connected can mean for you. While you might think that the first thing you need is a tablet PC, I suggest your first decision be the app or software that you will use. When you begin to explore the apps available for the aviation market, you’ll find everything from simple electronic logbooks to complete navigation suites that provide detailed moving maps, legal approach plates, weather graphics (from ADS-B or subscription), document organization, flight plan filing and more. Depending on how (or what) you fly, you’ll need to choose the app that best meets your needs. Another important reason why you’ll want to choose your app first is compatibility. The Apple products were the first application chosen by software designers and many apps are still only available on the iPad, iPhone, etc. The Android operating system, designed by Google, has made significant inroads and has actually surpassed Apple in raw user numbers, so companies are now producing apps for Android as well. In short, the app you chose may dictate the hardware you will want (or need) to purchase. While most apps contain detailed information about airports and services available, some are best used as pre-flight tools allowing you to lay out your entire flight plan. Some even offer “Preferred Route” guidance and allow you to file your flight plan and cancel at the completion of the flight. Other apps shine in the in-flight role with great mapping, geo-referenced approach plates, obstacle warning, and even airport taxi information. With additional equipment, you can have subscription-free weather and traffic via ADS-B and more. The three primary players offering these complete navigation suites are ForeFlight, Garmin, and Hilton Software. ForeFlight, LLC. – This app was one of the first (2007) and started out as a pre-flight briefing tool. It has since expanded to become the most popular pre-flight and in-flight navigation app for the Apple iPad and iPhone. When combined with their Stratus 1 or Stratus 2 (with AHRS) ADS-B receiver, you have ADS-B WX and traffic. With the 2, you have a back-up attitude instrument as well—all in one very capable package. ForeFlight offers a free 30-day trial, which, by the way, is the best way to choose an app! Visit www.foreflight.com for more information. Garmin – Although Garmin was late to enter the game (Yes, they hoped it would go away! ), they’ve made up for lost time and now offer a complete navigation package similar to ForeFlight. If you’re flying behind Garmin equipment, Garmin Pilot offers similar menus and screens emulating what you see on your 430W or GTN. Add Garmin’s Flightstream 110 or 210 (with AHRS) WiFi box and their GDL-39 ADS-B receiver and you have WX, traffic via ADS-B, and wireless downloading of your flight plans into the GTN Series and 400W/500W Series navigators—plus, attitude back-up with the 210. Unlike ForeFlight, Garmin Pilot is available for Android devices and Apple iPads/iPhones. Garmin also offers a free 30-day trial. Visit www.garmin.com for details. Hilton Software – The WingX Pro 7 from Hilton Software is best known for its strong in-flight tools and was the first to offer synthetic vision. Today, it’s a good pre-flight tool as well. This product, like ForeFlight, has been around a while and is only compatible with the Apple iPad/iPhone series. They offer a 30-day trial for 99 cents. Learn more at www.hiltonsoftware.com. I offer no recommendations here. Though all are affordable, these apps are complex and you’ll need to get into them and/or hit the forums for consumer feedback in order to determine what will work best for you. Unfortunately, the concept of choosing the software before you choose the hardware is inconsistent with a free trial. After all, you’ll need the hardware to do the trial—duh! Tablet PC: Apple or Android? Let’s talk about hardware. 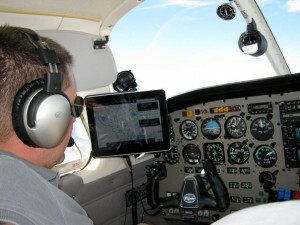 Apple’s iPad was first on the scene and, frankly, it remains the most popular tablet used by pilots. However, as I mentioned, Android, by Google, recently surpassed Apple in total tablet sales. This means there are now a lot of options available with Android operating systems. Though you’re likely to find a great deal on an Android unit, know that there are a lot of low end Android tablets on the market. If you’re going to use a tablet in an airplane with expectations of reliable performance, easy-to-read display, and reasonably fast processing, cheap is NOT the way to go! Look very closely at the specs. Conversely, there’s no such thing as a cheap Apple! My wife’s iPad II and my cheap 9” Android (from China) are not in the same class. I only use my tablet to read books, so I have very little on the line. Once you learn the features and benefits of the “connected” concept, you’ll start to depend on it, so make sure you get something you can depend on. Honestly, it’s hard to ignore the iPad/iPhone in this application—enough said. Be sure to get a device with enough memory! Most tablets are NOT upgradeable for memory storage. You can’t add more memory so you’re better off getting it right up front! iPads are available in 16 to 128 GB versions. I’m sure Androids offer similar options as well. I recommend you get at least 32 GB so you have plenty of memory for all aviation data and your everyday computing needs. Another major consideration when choosing a tablet is where you plan to put it. I always flew cross-country with a kneeboard. Then again, I was flying VFR. In IFR conditions (especially without an autopilot), looking down at a kneeboard and back to your panel opens the door to spatial disorientation, so that’s certainly not the best option if you’re prone to SD. Mounting to the yoke makes sense for some, but it doesn’t work for everyone. Tablets come in different sizes, and while we like to think that “bigger is better,” sometimes bigger may not be the right fit in your cockpit. When choosing a mount location, be sure to consider sunlight heat, glare, and avionics interference. RAM Mounts (www.rammount.com) has dominated the portable mounting market and makes mounts for the iPad series and virtually any other tablet, including glareshield and suction mounts like the one shown here. iPads offer good battery life: approximately 8-10 hours for reading and Internet or 4-6 hours in an airplane when an external GPS is attached. This is usually enough if you take off with a fully charged battery—and you should! If you’re driving a Bluetooth or WiFi ADS-B receiver, it may also be battery-driven or need an aircraft connection. If you’re considering (or already own) an Android tablet, know the specs on battery life and what to expect. You may need to recharge in flight and you’ll need a good power source. In my opinion, the cigarette lighter plug is the worst electrical connection known to man! It’s a shaky connection to start with and, as you know, airplanes shake. The last thing you want to see is your portable device reporting “low battery” because the connection was lost somewhere along the flight and you didn’t notice. Lone Star Aviation Corp offers a fully TSO’d, high-quality cigarette lighter receptacle for $89.95 that comes with a rubber cover identifying the voltage. Of course, it’s important that you know the voltage of your aircraft’s receptacle (14 or 28v) and make sure it’s compatible with the new equipment! You may need a step-down converter in 28-volt aircraft. Visit www.lonestaraviation.com for more information. Also note that you may need to charge more than one unit at a time so make a provision for this. USB chargers use a single cigarette lighter receptacle and frequently have multiple USB charging ports. This is better than one of those clunky automotive multi-plugs. USB chargers come in different amp ratings. Get 2.1 amps or better to meet the needs of the bigger tablets. Navigation apps require a GPS position source. There are a few ways to go with this. First, you can buy a tablet with built-in GPS, but rumor is that built-in GPSs are not quite as accurate as the external ones. Second, a number of manufacturers offer external GPS engines that plug into a tablet. Third, there’s a good chance you’re thinking about ADS-B—specifically ADS-B “In” with its free WX and traffic. Virtually all of the portable, wireless ADS-B receivers have internal GPS engines so you accomplish both ADS-B “IN” and GPS with a single unit. Personally, I think this is the way to go. Now, you have WX, Traffic, attitude backup (with an AHRS model), and an incredible amount of mapping and data at your fingertips for just pennies verses the cost of a new MFD—not to mention all the certified sensors you would need to have the same capability as your tablet! Note that some of these additional features (synthetic vison for example) may be subscription based. Still, the bottom line is enhanced features and significant savings. Let’s now take a look at some of the more popular configurations in use today. ForeFlight Mobile and the Stratus 1 or 2 ADS-B Receiver: These units only work together and are likely the most popular configuration to date. Again, they’re for iPad/iPhone only. It’s popular to have ForeFlight and Stratus available on both your iPad and your iPhone with the later serving as a backup. ForeFlight Pro is $150 per year and the Stratus 2 (with AHRS) is $899 (no subscription). You’ll have some additional costs for mounting and charging peripherals and, obviously, you’ll need an iPad. Garmin Pilot, GDL-39 3D and Garmin’s Flightstream 210: Like ForeFlight, the Garmin products only “talk” to each other; however, these units can display on either an Apple or an Android. The GDL-39 3D (with AHRS) provides ADS-B “IN,” GPS, and attitude backup to Garmin Pilot. The Flightstream 210 provides two-way, wireless communication between Garmin Pilot (your tablet) and the Garmin GTN and 400W/500W series navigators allowing you to wirelessly load your flight plans. You plan at home and load in the plane. The Garmin Pilot Premium IFR Version is also $150 per year. The GDL-39 3D is $899 and the Flightstream 210 is $999. Yes, a bigger investment, but remember, you’re now connected to your Garmin GTN or 430/530W navigators for easy flight plan transfer. I’m not sure you can truly call yourself “connected” without a wireless link to your navigators! Access ADS-B traffic and subscription-free weather on your aviation portable or mobile device with Garmin’s GDL 39 ADS-B receiver. When using Garmin Pilot on your mobile device, the GDL 39 can provide highly accurate WAAS GPS data, while providing backup attitude indication and SVX™ synthetic vision view. WingX Pro7 and an external ADS-B/GPS: Like Foreflight, this is only available on Apple iPads/iPhones. Frankly, it’s harder to put a firm price on the WingX option. Unlike, ForeFlight and Garmin, WingX does not offer their own ADS-B/GPS option. There are, however, a number of manufacturers that make a WingX compatible stand-alone GPS engine or compatible ADS-B “IN”/GPS receiver and their prices vary. The standard WingX Pro7 app is $100, but there are desirable options for IFR pilots, like geo-referenced charts and synthetic vision, that move the subscription price up. WingX, however, does offer discounts for 3-year commitments. Some pilots are passionate about WingX’s in-flight features. You may want to find out why! Aspen Connected Panel/Connected Pilot: Aspen’s approach is a little different and more of an investment. As I mentioned before, I don’t think you’re really “connected” unless your smart technology is linked to your certified avionics, and Aspen was the first to offer this option. Simply stated, this option is for a pilot with a dual-screen Aspen installation now (PFD and MFD) or for a pilot planning for said installation. That’s not a bad thing since I’m a big fan of Aspen products, but it does significantly change the financial equation. Aspen’s Connected Panel integrates with either Apple or Android tablets and provides two-way connectivity between said tablet and Garmin 400/500W navigators. Using the Aspen CG100 WiFi interface and an EFD500 or EFD1000 MFD, Aspen has created a gateway between smart technology and certified avionics from different manufacturers with the emphasis on safety by putting the MFD between the tablet and the certified unit. Nothing passes between the tablet and the navigator without the pilot first seeing and acknowledging the information transfer. (Note: A recent Garmin software update has affected this link to the 430/530W. Pilots using older software versions have no problem, but as of this moment, I don’t think this issue has been resolved and no link has been developed for the Garmin GTN series). It would be logical that Aspen would also want to make their Connected Panel available for pilots flying behind the new Avidyne IFD Series. Avidyne has been more “friendly” to other manufacturers’ products, but no announcement from either Avidyne or Aspen has come forth. Avidyne has confirmed that the IFD Series was designed with WiFi and Bluetooth capability in mind so it’s apparent that they recognize that the interface between portable smart electronics and certified panel avionics is here to stay. To get a sense of the features and benefits of the “connected” concept, I talked to a flying buddy who has been using the technology for 10 years. Jim Deutsch is a frequent flyer in his Beech Debonair and lives in Punta Gorda, FL. Like me, he’s an “airplane nut.” When he’s not in the air, you can find him at the local RC flying field. Ten years ago, Jim was flying Westwinds and his company dabbled in the EFB thing. He was not impressed. Features were limited and readability was poor. Today, Jim uses WingX Pro7 connected to a NavWorx ADS600 ADS-B UAT (Universal Access Transceiver) on his iPad. The ADS600-B is a remote mounted UAT which transmits ADS-B “OUT” information, as well as, receives ADS-B “IN” information including ADS-B, ADS-R, TIS-B traffic and FIS-B weather. Providing multiple interfaces allows the ADS600-B to support a variety of panel-mounted EFIS/MFDs and portable displays. Standard features include an internal WAAS GPS, RS232 channel for an external altitude encoder, RS232 and RS422 interfaces for a variety display devices, and a secure slide-lock attachment for the DB37 system connector. No paper in the cockpit – After years of lugging around paper IFR approach plates and doing the cumbersome updates every month, Jim celebrates the advent of digital approaches in his cockpit. It saves weight and time and is a clear improvement in approach situation awareness. Readability – Jim notes that the iPad’s display is far superior to EFBs and other portable GPS units in sunlight conditions and is much easier to see—another strong argument for the iPad vs. other displays. “Rubber Band Re-Routing” – Here, Jim is referring to a feature available in all three of the primary nav apps used for editing routes in-flight. If ATC diverts you to an alternative waypoint, you simply put your finger on the course line and move it to the new waypoint, like a rubber band. Though Jim does not have a connection between his iPad and his avionics with WingX Pro7, he acknowledges the value. Jim plans to update his existing UPSAT GX-60 to a new Garmin GTN-650 this December. The Garmin Pilot app with the Flightstream Bluetooth, nav interface option (as I show above) would update a new route in his GTN with the push of a few buttons. This is what I’m talking about when I suggest being totally connected. Jim did point out one disadvantage of being connected—the learning curve. As I mentioned, these are complex planning and navigating tools. You need to learn them on the ground AND be able to use them efficiently when needed in flight. On that note, let me share a few tips I picked up while researching this article. First, let me say that Sporty’s Pilot Shop is an excellent source for iPad/App information and I must credit them for having a comprehensive approach to iPad connectivity. Sporty’s iPad Pilot News is jam packed with info and advice for potential iPad app buyers. Check it out for yourself at www.iPadpilotnews.com. Preflight your iPad before you take off. Confirm that it’s fully charged and that your maps and charts are downloaded. Fly for a while with paper charts until you’re comfortable with the process. Jim mentioned overhearing a conversation between ATC and a pilot with a new tablet in his aircraft. ATC issued a route change and the pilot couldn’t figure out how to make the change on his tablet. Obviously, this was not the time or place to learn! No paper on board? Have an electronic back-up! Chances are, if you have an iPad, you have an iPhone. Load the apps on both in the event of a problem with one. There is no requirement for Part 91 aircraft to do this, but common sense frequently trumps FAA regulations. Turn off Auto-Updates! Latest versions of the iPad software include an auto-update feature. If the update comes at the wrong time and you don’t have an Internet connection, you may have a problem. Choose to be notified of updates and maintain control. Keep your iPad out of the sun! Lithium ion batteries hold a lot of power in a small package, but they are temperature sensitive. Try to keep your iPad out of the sun in flight and never leave it on top of the panel. The unit will shut down when it reaches the upper end of its temperature range (about 95 degrees). I flew a lot in Florida where this was an obvious problem. The use of a smart tablet PC with an aviation nav app is here to stay and a great IFR tool in the cockpit. Frankly, it has a place in VFR as an alternative to a portable GPS as well. Portable GPS manufacturers have worked hard to include features that pilots want, but I don’t think they can keep up with the aviation app designers. IFR or VFR, the benefits of ADS-B “IN” WX and traffic are valuable and the tablet PC display option combined with an ADS-B Bluetooth or WiFi receiver is an affordable way to add these tools to your aircraft. Many customers avoid portables because of all the wires. Wireless technology solves most of those issues. If you’re IFR, the features and benefits of a smart device in the cockpit are obvious. If you’re VFR, you can still benefit especially if you plan to add ADS-B “IN” capability to your aircraft. Non-certified ADS-B receivers are a lot less expensive and designed to interface wirelessly to your tablet, either Apple or Android. It’s an exciting option that many pilots have already taken advantage of. If you’re not in yet, check out what’s available and what you need to spend to have it. It’s worth a look! Until the next time…Safe and Happy “Digital” Flying!